How India is changing the world through International Solar Alliance! 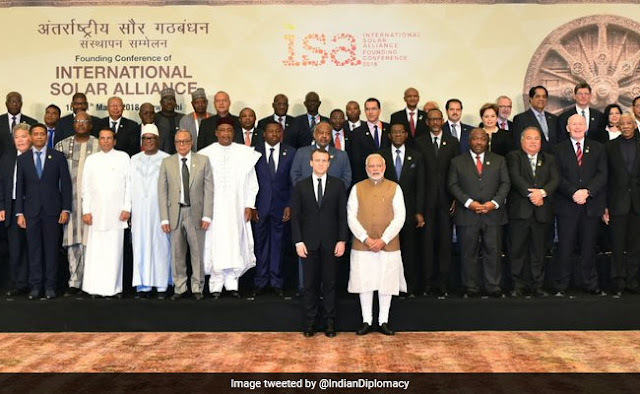 The International Solar Alliance (ISA) is an alliance of 121 nations mostly lying either completely or partly between the Tropic of Cancer and the Tropic of Capricorn. The main objective of ISA is to promote the use of solar energy and to reduce the dependence on fossil fuels. In this article, we will cover every thing that you need to know about ISA. It is a treaty-based inter-governmental organization. Countries that do not fall within the Tropics can join the alliance and enjoy all benefits as other members, with the exception of voting rights. It was unveiled by Indian Prime Minister Narendra Modi and then French President Francois Hollande at the U.N. Climate Change Conference in Paris on November 30, 2015. The idea behind this was to form an alliance of countries that receive a lot of sunshine come towards a common approach to complete their country's energy requirements. The framework agreement of the ISA opened for signatures in Marrakech, Morocco in November 2016, and 121 countries have joined. It's headquarters are at the National Institute of Solar Energy (NISE) in Gwal Pahari, Gurugram, India. The Indian government has dedicated five acres of land on the NISE campus for its future headquarters. The Indian government has also contributed US$25 million to build a campus and for meeting expenditures for the first five years. The ISA has set a target of 1 TW of solar energy by 2030, which current French President Emmanuel Macron said would require $1 trillion to achieve. India is the founding member of the ISA. India plays a significant role by being a host as well as a major contributor to the achievement of the target. The ISA is the first international body that will have a secretariat in India. India aims to produce 100 GW of solar energy by 2022,which is one-tenth of ISA’s total goal. India will also provide 500 training slots for ISA members to start R&D in the field of solar energy. India also aims to strengthen its relations with African countries through this alliance. It is a relatively new initiative but a lot of progress has been made so far. Since 2015, 28 crore LED bulbs have been distributed in India which has saved 4 GW of energy and also US$2 billion. ISA has partnered with World Bank to launch Global Solar Atlas at an ISA event at the World Future Energy Summit in Abu Dhabi. Global Solar Atlas is a free online tool that displays annual average solar power potential at any location in the world and thus identify potential sites for solar power generation. On June 30, 2016, World Bank and ISA signed a deal to collaborate on increasing solar energy use around the world, with the goal of mobilizing US$1 trillion in investments by 2030. In January 2018, during the World Future Energy Summit (WFES) held in Abu Dhabi, India announced the establishment of a US$350 million solar development fund to enable financing of solar projects. thRadical :Short notes for Competitive exams: How India is changing the world through International Solar Alliance!